In this episode Chuck and host Kimberly Henrie discuss about proper care of your sterilizer or autoclave including cleaning, maintenance, calibration and certification. You won’t want to miss this information-packed episode. Chuck also answers Kimberly’s question about why the Food and Drug Administration even cares about sterilizers in the first place. After all, it is not food or a drug, right? The answer why the FDA cares might surprise you! 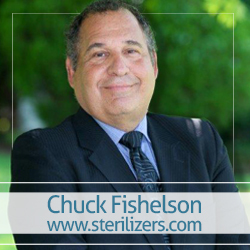 Listen to Chuck explain what role the CDC plays with sterilizers and how they are used in various businesses. Do they make recommendations only or can they make rules regarding them? You will not want to miss hearing Chuck discuss their role in the sterilizare and autoclave industry. Chuck wraps up the podcast with suggestions for cleaning your equipment.